The index opened flat to positive and went up to touch the highs of the day around 8379 but Profit booking saw the index dip towards 8321. The smart buyers came back and moved the index back in green and closed at 8362.65, gain of 18.40 points. The broader market was positive, with 802 advances to 746 declines. Range for the series is 8000-8500. 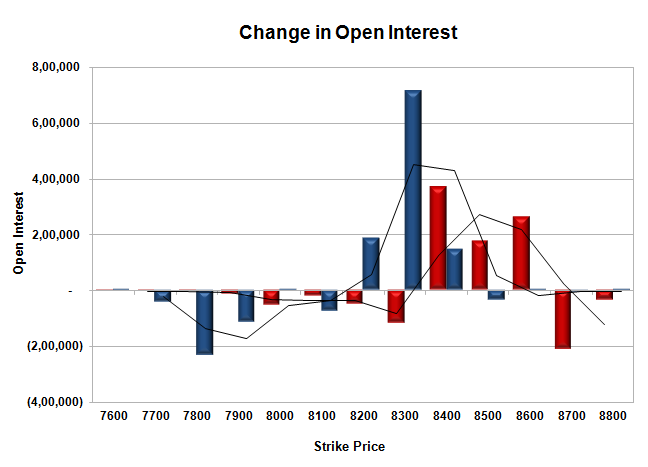 Call option 8400-8600 added huge 8.10 lacs OI with short covering seen at 8300 and below strike prices. Put option 8400-8200 added huge 10.50 lacs OI with profit booking seen at 8100 and below strike price. Nifty Open Interest is at 2,31,93,075 up by 70,150, with small increase in price, probably long build-up. 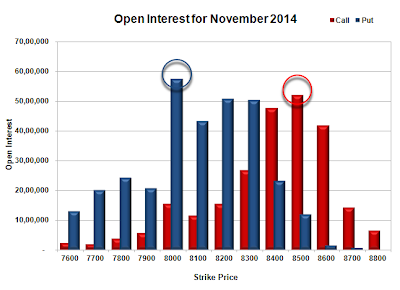 Bank Nifty Open Interest is at 20,93,725 up by 72,850, with increase in price, probably long build-up. 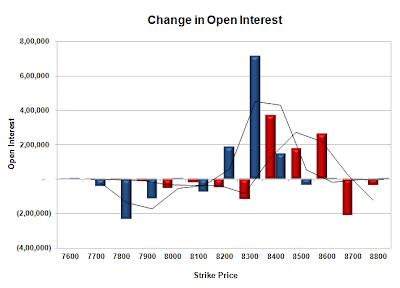 FII’s sold 3.70 lacs Futures, which includes 1346 contracts long build-up and 16154 contracts short build-up, with increase in net OI by 17500 contracts (includes 38084 longs to 52892 shorts for the day) and the Average Price comes to 8366.72. FII’s Index future open contract as on date is 730739 Longs to 138142 Shorts, net long 592597 down by 14808 contracts. 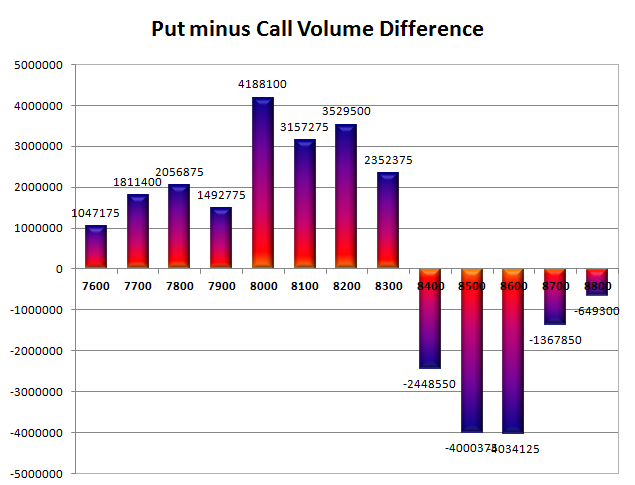 Initial good support at 8300, with huge OI of 50.35 lacs and below that at 8200 with huge OI of 50.87 lacs. Initial resistance still at 8400, with OI of 47.69 lacs and above that at 8500 with OI of 51.96 lacs. Day Range as per Option Table is 8297 - 8416 and as per VIX is 8298 - 8427 with 8354 as the Pivot.